A way to deter Goannas? Is there anything I can do to keep Goannas away from our campsite? We have a child under two and are worried about the Goannas that hang around our campsite when we go on holidays. We camp at Bribie Island QLD. We tend to have anywhere from 4 to 8, and they are very large goannas! They carry on about their business as if we weren't even there! They are not scared of us at all! We are very careful about food and rubbish, too. We don't want to hurt them in any way but it's hard to relax with them around. I was hoping you might have some sort of miracle scent or something that might deter them. Response to: A way to deter Goannas? I understand your predicament. We had a couple of big goannas at the sugar mill in Kununurra where I used to work. They'd strut around as if they owned the place, and they hissed at us whenever we crossed their path! I don't think that you really need to be concerned, but I do understand that you can't relax. Maybe another reader has any suggestions? Please chime in via the comments if you do! Comments for A way to deter Goannas? I am glad you want to avoid harming these amazing creatures. The biggest lizard I have ever seen here in south central British columbia wsa a Northern Alligator Lizard, about 8 inches long, weighing less than a Perenty tongue! Perhaps you could try different textures - say a slippery plastic sheet for starters - to find something they don't want to cross, to serve as an exclusion barrier. I would be worried about a young child near goannas too, they have a go at anything, unafraid. 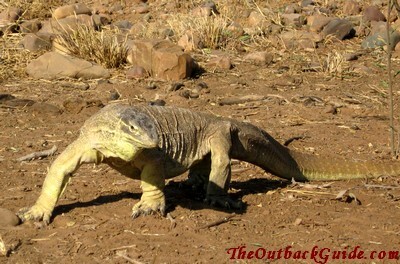 Have lived in the bush many years, and find the goannas are getting bigger all the time, breeding Comodo dragons here. The only deterent I have found is a large dog, goannas dont like big dogs, just the dogs presence is usually enough. Yeah, I'd take my chances with the goanna over the big dog around my 2 year old. If you have a well trained large Dog, your 2 year old will never be safer. Strangers and lizards alike will no longer bother your child. I live on a farm and the bastards love eating our chickens and going after our little dogs. I love native animals but these things are quite cruel. I don't want to create animosity towards these animals- they're simply big and stupid and hungry. Sure they wouldn't go after a child (baby alone in a crib I'm not so sure-coarse you will always be watching it so nothing to worry bout there). You certainly don't and should never kill them (by the way it is illegal to do so!). Better to relocate them (rangers will say this is illegal too cause they are territorial but its certainly less cruel then people killing them). The best way to deal with them is a) get a wooden pole, thread a rope through it, make a lure, get the thing by the neck with the rope holding onto the wood to lift it, pulling tight on rope(don't worry they're tough- they will twist and hiss, that being said don't break its neck... but its not something you can be gentle about either), throw it into your family bin and relocate it far into the bush as you can go- away from ppl's houses (be considerate)and anywhere where there may be endangered species liable to get eaten by it. b) if the thing runs away (which they normally do) or it isn't in your chook pen and is able to be cornered, then leave out a cage-trap (quite easy to make- look it up online) with some meat (not dog food! For the love of God try a cow bone or a hunk of steak they won't take down a cow- but if you get them liking dog food it will go after someone's dog and encourage them near ppl- they hunt by scent remember! They can smell empty dog food cans- which brings me to my next point, wash out your meat trays, and dog food cans etc if you have a goanna problem). We have relocated 5 goannas now, so I'm speaking from experience here. I have at least 2 in my roof, one over 4 foot long. Don't particularly want to kill them but it's getting beyond a joke. However don't want to end up with worst of all worlds - ie dead goanna in roof. Any suggestions? i have a 4-5 foot long goanna in my roof also. I'm not keen on it getting so big it can't get out of my roof, it's already caused some leaks and I imagine could do a lot more damage if it gets stuck, or stink like hell if it dies up there. Any ideas on who to call in Sydney? We live in Killaloe (near Port Douglas) and have many goannas living near us. They like to come and sunbake on our driveway and wander around. However, lately one has taken at running at us on different occasions. I am not quite sure why this is happening or what it would do if we didn't stamp our feet or carry a broom with us. As quickly as it runs, it loses interest. This behaviour is a bit out of the ordinary and I am wondering why. Does anyone have any clues? Camping at Ocean Beach campground, I understand your gonna struggle. We'vet determined a bubble wand will let keep them at bay for a little while. It seems to scare them off. I have a goanna in my roof. How can I remove it? My comment is that I'm trying to establish what, if anything, will deter goannas, that visit our roof area? Shoot them!! There are a lot around where I live and they are always killing my small/ baby farm animals. I shoot them and take them to an aboriginal community close by.